Fruits and vegetables lower a person’s risk of developing chronic diseases later in life by providing essential vitamins, minerals, and fiber. Aim for 5 servings per day, eat a variety of colors, and choose seasonal produce at the store. Find simple ways to increase your fruit and vegetable intake in little amounts throughout the day, such as pre-chopping your fruits and vegetables when you first get home from the store to make them accessible on busy days, throwing your favorite vegetables into eggs at breakfast time, grabbing whole fruits for a quick snack, and stocking up on frozen vegetables for a quick side dish with dinner. Whole grains provide energy, fiber, protein, and essential oils. Try to make at least 50% of your grains when eating bread, rice, or pasta-or try an ancient grain such as quinoa or amaranth. Protein is essential for building muscle and tissue, promoting healing, increasing our immune system, and providing energy. Limit processed meats (bacon, sausage) and red meats to 1-2 servings per week, but include a variety of other protein sources during the week. Eggs, low-fat dairy, chicken, fish, and turkey are all lean, heart healthy meat sources. Don’t forget to include tofu/soy, beans, nuts, and seeds for plant based alternatives. The Flagstaff mountain campus is located at 7,000 feet above sea level-meaning the air is dryer and we’re more likely to lose water through increased breathing! It’s common for students to feel headaches, fatigue, and decreased exercise performance when first moving to Flagstaff. Be sure to carry water with you at all times and use the following equation to stay hydrated. The key to healthy eating is planning! Smart shopping can save a person time and money, but also helps ensure that they make healthier choices. Watch the video below for grocery shopping tips or visit our event calendar for details on our next guided grocery store tour. Asking for whole wheat bread, buns, rice and tortillas. Ordering extra vegetables with your salads, smoothies, soups, and burritos. Opting for lean or vegetarian protein sources, such as roasted/grilled chicken, turkey, tuna, or beans. Drinking water, unsweetened tea, fruit infused water, or low-fat milk with your meals. Asking for dressings and sauces on the side with sandwiches and salads. Limit how often you go to places that offer mostly fried foods to 1-2 times per week. Using the Mobile Dining App to find the nutrient content of foods, allergen info, and vegan/vegetarian options. Set a goal to make at least half of your plate full of vegetables. Go for whole grains: ask for whole grain/whole wheat bread, buns (or ask for lettuce leaves and make a lettuce wrap! ), whole wheat tortillas, rice, and pasta. Check out the Superfoods Bar for fresh salads made with vegetables, ancient grains, dried fruit, and legumes. Homemade hummus and fresh greens are also available daily at the Superfoods bar. Menus within the Hot Spot and the DuB are labeled to identify milk, eggs, wheat, gluten, soybeans, fish, shellfish, peanuts, and tree nuts. Simple Servings is a platform within these locations featuring menus that avoid most of these allergens (occasionally, fin fish such as tilapia or tuna will be offered). Many items across campus are easily modifiable to be come gluten free, vegetarian, or dairy free. The Wedge and Eat Market both have several snack and meal items that are gluten free and dairy free. Dining Dollars can be used on these items. If you have a life threatening allergy, carry your Epi-Pen with you at all times. Inform your friends and/or roommates of your allergies and symptoms, as well as what to do in case of a reaction. If you have a reaction that takes place in the dining hall, alert a staff member or have a friend alert a staff member to call for medical assistance. Introduce yourself to the managers and chefs! All managers are Allertrain certified and happy to help you find options on campus. Contact the NAU Registered Dietitian for a free dining tour to help identify options on campus. Alert your servers to your allergy and ask them to change their gloves and use clean cutting boards, utensils, and pans for your food items. Ask a manager to review a food label or recipe if you have any concerns about an item. Report any allergic reactions to a Campus Dining Manager. If you’re feeling overwhelmed, start small! Even small breaks throughout the day to walk or stretch have benefits for health and wellness. 75 minutes of vigorous intensity physical activity (such as running or biking) per week. This is only 10 minutes per day. Any combination of moderate and vigorous intensity physical aerobic activity. Don’t forget to throw in some strength training! Lift weights, use resistance bands, or choose exercises that use your body weight at least twice each week. Be sure to target all of your major muscle groups for maximum benefits. 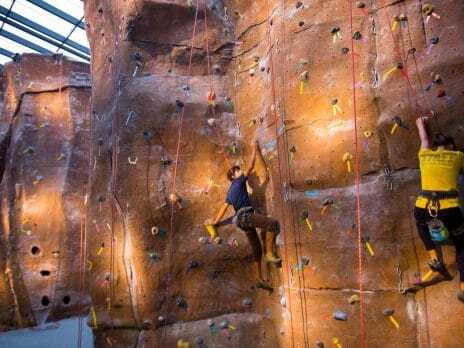 A full gym with free weights and machines, a rock-climbing wall, running track, and racquetball courts, as well free equipment you can check out, such as basketballs. Enroll in a FIT 100 class and choose between for-credit or non-credit fitness courses offered through the Department of Health Sciences. Join a sports club or intramural team if you are looking for a team atmosphere. Explore beautiful Northern Arizona with NAU Outdoor Adventures. Students can register for outdoor adventure trips and rent low cost outdoors equipment such as camping gear and snow shoes. Cruise through campus on a Yellow Bike – available free to all students on campus. Take a walk through campus on one of the Bites & Hikes trails. Have you always wanted to fly? Try out the silks or trapeze at Flagstaff Aerial Arts. Check out one of the many martial arts studios in Flagstaff. Go Dancing! Check out the calendar at Flagstaff Dance for fun and varied dancing events around town almost every night of the week! Flagstaff offers beautiful scenery for all sorts of outdoor activities, so you can have fun hiking, trail running, mountain biking, or exploring. Don’t know where to start? Check out the Flagstaff Urban Trails system. If you’re looking for ways to increase your intake of fruits and vegetables, visit our Event Calendar for events designed to teach you how to shop, cook, and eat!